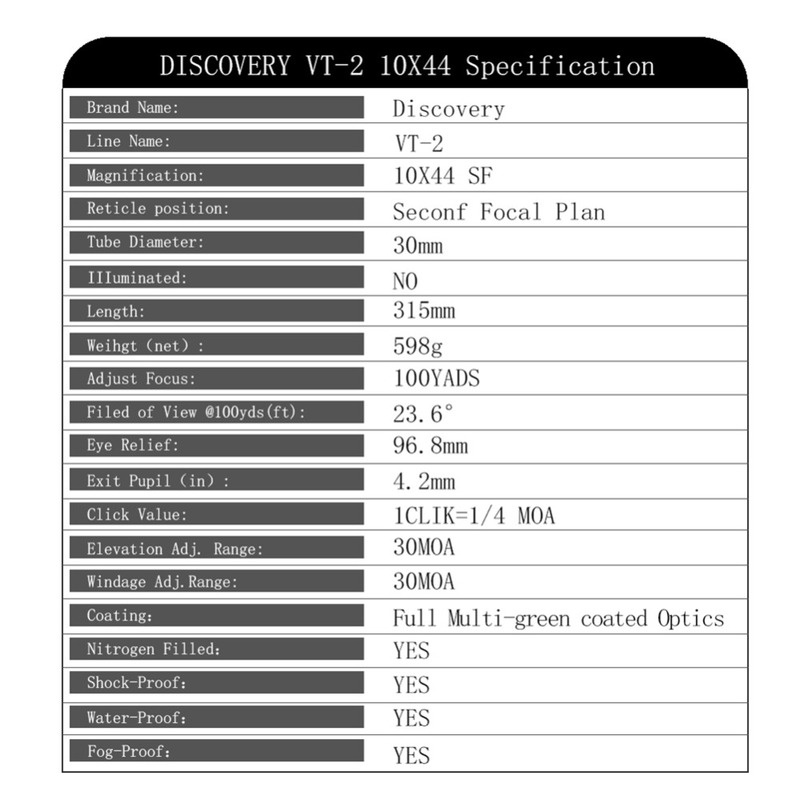 Forums › Optics, Scopes, Rings, & Mounts › Discovery VT-2 10X44? Anyone tried this scope. I've read a lot of good things about DIscovery scopes, just not this particular model. I know this is a stretch, but wondered if it could be a cheaper, shorter, lighter alternative😁 to an SWFA. Yeah, I know that's probably not realistic, just thought I'd ask. I am supposed to have one coming soon . But I Have tried the Tac Vector fixed ten power . Nice scope. Not a SWFA bit it also was half the price ! If you're looking for a cheaper alternative to the SWFA 10x I would look at the lowly UTG. It has an etched glass mildot lighted reticle with side focus for just over $100. For airgun ranges (and only 10x) I don't think you can find a better value. I am actually thinking of putting mine on a 20ga slug gun this coming year. It's worked great for me. Thanks for your responses guys. I think I'm going to give the Discovery a shot based on what I've read about their other scopes. I got a 12x swfa I like but I'd prefer something that's shorter, and lighter (and nearly $200 cheaper) to go on my Veteran. The DIscovery is about 5 ounces ligher than the UTG which is very appealing. I have two Discovery scopes. Great value for the money! Let us know if it really is. UTG lists the weight as 21.9oz. I just weighed mine with a sidewheel on it and it is 21.5oz. Didn't want to take it off, but I think the wheel would have to be 1.5oz so that puts the scope at 20oz max. When I look at both Amazon and Aliexpress the Discovery is listed at 598grams which is 21.09oz. I got the Discovery weight from airgunoptics.com shown as 16.86 oz. DIscovery-optics.com also shows the same weight. Sure hope that's correct. Guess I'll find out in a couple of weeks. I ordered one from Amazon and sold by Discovery Optics. They didn't show a weight on the Amazon page. For $105 I'll be a happy camper if the weight is correct and the quality is similar to what I've read about other Discovery scopes. When I checked Amazon there wasn't a 10×44 from Discovery Optical, only the one by Apex Horizon Discovery, and it has the same graphic on weight as the Aliexpress. Hope it is lighter like you say. When I checked Amazon there wasn't a 10x44 from Discovery Optical, only the one by Apex Horizon Discovery, and it has the same graphic on weight as the Aliexpress. Hope it is lighter like you say. Well crap, I think you just rained on my parade. That's the one I ordered. It is sold by Discovery Optics. I was so sure it was the same scope that I didn't look closely enough. It was about $12 cheaper thru Amazon. Now I'm thinking it's probably an older heavier version and newer ones or lighter, maybe. Either that or you can't pay any attention to either, who knows. I sent an email to the vendor asking to cancel my order depending on the weight. We'll see how that goes. Canceled my order from Amazon, it was the heavier version. Reordered from airgun optics plus after texting Charlie to confirm the actual weight was 16.86 oz. I took a look at the link says apex discovery? But yet in the picture shows discovery? Nice that you were able to cancel. I can vouch for the fact that ApexHorizon sells 100% legit Discovery Optics scopes. I just bought two of them recently. They are basically the stateside Amazon equivalent of what Aliexpress is in Europe, with the exception that Amazon already has the stuff warehoused here with legit return policy. Theyy make some awesome scopes.